There must have been dust, must have been small arms and big arms gathering and packing, lifting and moving boxes and bags from indoors to out, to car trunks or truck beds. Blankets and cast iron skillets? A belt buckle or rabbit’s foot? Chairs? It’s impossible to know what each of them--Viola and her five children: Jack, Peg, Dell, John, and Sue--carried as they moved most of their belongings into storage at Viola’s brother Roy’s place. It was 1951 and Viola Waters Bedwell and her children were headed north from Clarksville to Detroit to join Lurton. It seems that Dell and John rode in a car with their Uncle Jesse and his wife, while Viola and the other children, for about $12 each, rode the Greyhound bus, a trip that would have taken close to 15 hours. What was the sound of the tires of each vehicle on the road? Were the children excited or troubled by such a move? What all was on Viola’s mind? What would each think, transplanted in the north, the first time it snowed? Regardless, they were soon to call Michigan home. And it would for each of them be a start from scratch: those stored belongings, to be transported north on another trip, for whatever reason, were never retrieved. 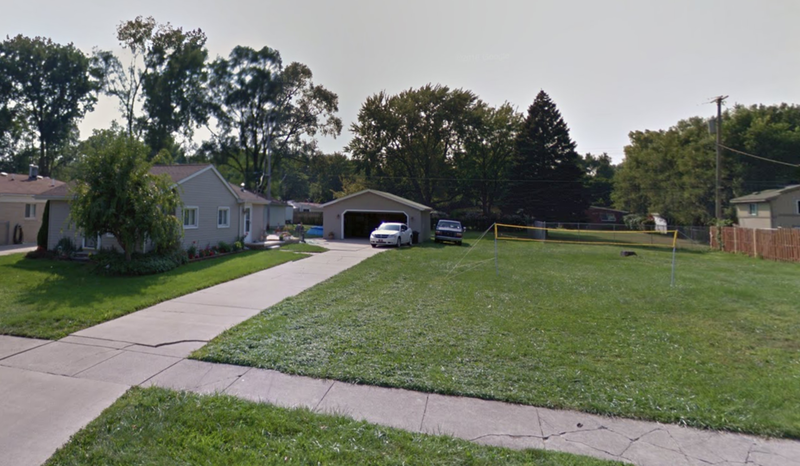 One of the first homes Viola, Lurton, and their children made in Michigan was at 6641 Fenton St. in Dearborn Heights, a suburb West of Detroit. Built in 1939, this single family, one bathroom house of a mere 695 square feet, was cozy, to say the least. This house quickly became a hub of activity for the extended family. It seemed to have “a revolving door” for all the relatives who visited and spent time there. This included Lurton’s mother, Sarah, for whom there was eventually built an efficiency addition onto the back of the house. The next house, at 7537 Gilman St. in Westland, was also a center for family visits and activities. But an extensive yard and Lurton's interest in animals also gradually resulted in what seemed like a small zoo outside, with even two ponies, Pixie and Dixie. This photo of Viola and Lurton was taken at that house. For many years during this time Viola’s husband, Lurton, worked for the Speedway 79 oil and gasoline company. In the 1940s there were dozens of classified ads in the Detroit Free Press for various employment at the “Speedway Petroleum Corp” at 301 S. Fort St. near Oakwood. Speedway had many filling stations throughout the Metro Detroit area. Rather than an attendant at a Speedway filling station, Lurton worked at the main 301 Fort location. His was a job that involved cleaning and maintaining the giant petroleum tanks that are still in use today. At some point Speedway became Marathon Petroleum Corporation. If the family lore is true, Viola’s husband spent hundreds, perhaps thousands of hours in and around these fumey tanks. And while this was a job sufficient to bring Viola and the family north, one can imagine the daily and eventual cost of such work. This was long before there would have been much in the way of health regulations, of cautions when breathing the air of those tanks. No doubt Lurton would come home each day with the lingering effects of it on his clothes. And eventually debilitatingly gathered in his lungs. Here is Lurton, possibly just home from work, with his and Viola's youngest child, Sue. She's wearing her very own "Speedway 79" hat and uniform, emblazoned with a "Susan." No doubt tired, but tender, Lurton warmly embraces Sue who's hand is proudly planted on her father's knee. Here is another photograph of Lurton in his Speedway gear. He is with his mother, Sarah Florence Lee Bedwell (1893-1965). Despite--or perhaps because of--losing her mother so early in life, Viola did not grow particularly close to Sarah, her mother in law. There are plenty of potential reasons why, but it does seem that Sarah conveyed a maternal spirit that Viola was deprived of as a child, at least to her own children. In 1946 Sarah penned “A Mother’s Blessing” that was published in The Leaf-Chronicle. It was a poem to her “baby,” her youngest child (and Viola's brother in law), Billy Jacob Bedwell (1927-2006), who was serving in the Air Force at the time. As the youngest of five, it was likely that Viola would experience the deaths of all of her siblings. This is exactly what happened, starting in 1972. Wade Waters (1906-1972), the second born of the Waters siblings, died on Thursday, June 29th, 1972. He was 68. Two years later Viola’s brother George Water (1910-1974) died. In the year between the deaths of her two brothers, Viola lost her husband, Lurton. By many accounts Lurton was not a healthy man. He was a heavy smoker and his years at the petroleum company could not have been easy on his lungs. At some point he became too sickly and was unable to work. Viola spent many years caring for Lurton before he died on April 20, 1973. In layman’s terms, Lurton had the chronic condition of Lupus. In his last year of life he developed lung cancer in the right lung. Days before death his lung collapsed. Minutes before, fluids accumulated. Viola would live another 27 years without her husband, just about 10 years shy of the 37 they were married. She would not just carry on, but would continue to develop her strength and independence, and would define herself by her dedicated work at Garden City Hospital and position at the center of her ever-expanding family.